We believe in studying and honoring the origins of the music that moves us - so we learn about the historical and cultural origins of each musical style we try out. We will also look at the ways music has been used in movements for cultural survival and social justice. Finally, we take our sounds to the streets! We seek out opportunities to interact in public and at community events. BoomShake also hosts an annual end-of-the-year party and a spring performance showcase for all our workshop participants. We encourage participants to use performance as an opportunity to express themselves creatively, support each other, and get in touch with their own power! We work to create a welcoming space for people who identify as women, girls, trans and gender-non binary. A place where people from various walks of life can come to recharge, have fun, and learn to make our movements more joyful! Learn drum rhythms, chants, movements and performance techniques inspired by street bands and drum corps from various parts of the world. The class is about feeling, counting, and playing rhythms. You'll get a chance to try different drums and percussion instruments in a variety of musical styles. You'll also learn to read and analyze rhythms; improvise and play solos; and interact musically with other players. 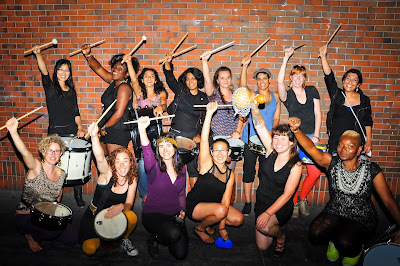 We'll experiment with using rhythm in movements for social justice - coordinating with chants, etc. This is a multilevel class - beginners are enthusiastically welcomed, but there should be a lot to interest experienced musicians as well (and many of the concepts are applicable to other instruments and dance as well as drumming). BoomShake Music’s Girls’ Street Drum Workshops are for young women ages 8-18 who want to take over the streets, build community, dig deep into rhythm and drum technique, sing, move, shout, fight for justice, and get LOUD! In workshops, students have the chance to try out a variety of drums and percussion instruments - bass drums, snares, toms, hand drums, cowbells, shakers and guiros - and may choose to specialize in a particular instrument. Students learn techniques specific to each instrument, as well as fundamental musical skills like listening, counting, and improvisation. We also teach singing and movement, and practice integrating vocals and choreography into drum performances. Students will also have the chance to create their own beats, songs and chants, and to explore their families’ and communities’ musical traditions. We incorporate guest presentations and field trips to live performances to bring students into direct contact with the diverse musical cultures of the Bay Area. *We are committed to making this financially accessible to people who are low-income. We offer a few options for payment plans, work trade and scholarships. If you find this cost-prohibitive and need alternative financial arrangement please email us before enrolling.